Always Best Care combines national strength and standards with local accessibility and personal service. The Always Best Care Fort Worth / Mid Cities team is dedicated to providing excellent care for our clients. We understand you can go anywhere for help, but we differentiate ourselves with great employees/staff, client focused service, and true accountability for you and your loved ones. Caregivers at Always Best Care Fort Worth / Mid Cities are experienced, screened, insured and bonded, providing the safest and highest level of personal care. We have strong relationships with senior care communities, social workers, hospitals and senior resources throughout Fort Worth / Mid Cities, providing both compassionate in-home care as well as free assisted living referral services. Are your staff that deliver elderly care in Fort Worth insured and bonded? They are. We know how important it is that you can feel like you can trust us, so all of our staff that provide home care in Fort Worth are bonded, insured, and covered by Worker's Compensation. We find that not only does this provide you with the assurance that your loved one will never be liable for any losses, injury, or damages but also at the same time helps to attract the best caregivers to come and work for Always Best Care. How are your staff that provide elderly care in Fort Worth vetted? Our vetting process is incredibly meticulous due to the level of trust that has to be put into a caregiver's hands. If an applicant manages to make it past our two-round interview process, they will then be subject to drug testing and criminal background checks. If that wasn't enough, our recruitment team also get in direct contact with references and double check an applicant's work history. While this all might sound a little over the top, we only ever employ people that we feel can provide the highest standards of elderly care in Fort Worth to seniors. What hours do your staff provide senior care in Fort Worth? We want families that live in and around Fort Worth to know that they can count on Always Best Care whenever they need them, so our caregivers are available 24 hours a day, 365 days a year. We understand that each senior is different and each family worries about different things, so having a fully flexible approach means we can help to accommodate every senior that requires home care in Fort Worth. Will my loved one have the same caregiver to provide them senior care in Fort Worth on every visit? Yes. We will match your loved one to the most suitable caregiver available, who will then become responsible for their senior care in Fort Worthfor the foreseeable future. For your loved one to truly become comfortable with their caregiving arrangement, they need to build up a level of trust with the person responsible for their care, so we will only change this arrangement upon your request. Of course, it's important to remember that a caregiver is permitted to take up to four weeks annual leave per year, so there may be occasions where a substitute caregiver will take over the mantle. When this does happen, the substitute caregiver is made fully aware of any preferences that your loved one may have, so you don't have to worry about any disruption to their usual care. Finally, if your loved one requires care at different points throughout the day and night, we may have to introduce more than one carer into their daily schedule. How will my loved one be matched with their caregiver that's responsible for providing their elderly care in Fort Worth? Our process is fairly straightforward - you answer some simple survey questions on behalf of your loved one and we'll match them up to the answers our caregivers provided on the same test. By matching their hobbies and interests, we find that the two often have something to bond over from the get go. There are also other considerations to take into factor, such as the level of physical care needed, that play a part in who we choose to provide home care in Fort Worth for your loved one. How are your caregivers trained to provide senior care in Fort Worth? Once a new member of staff has accepted a job offer from Always Best Care in Fort Worth, they will be required to undergo a week's worth of training to prepare them for their new role. Topics that are gone over include work on their communication skills and ability to spot symptoms of illness. Even once they're in their role supplying senior care in Fort Worth, they will undergo an annual refresher course to keep them up to date with the latest caring techniques and equipment. Why should I choose your elderly care in Fort Worth instead of an independent provider? As shoppers, we always hunt for the best bargain, but when that bargain involves the questionable quality of home care in Fort Worth that your loved one could receive, you have to wonder whether it's the correct approach for finding an in-home care provider. Instead, we tell potential clients to look at the facts. All of our caregivers have been vetted, bonded, insured, and trained to provide a service that you can always trust. If an independent provider isn't offering these things as standard, then the alarm bells should already be ringing. How quickly can my loved one expect to begin receiving senior care in Fort Worth? Thanks to our experience and resources, we're able to have a care plan and caregiver in place within seven days of your first contact with us. This includes carrying out a risk assessment on your home, creating a nutritional meal plan, matching your loved one to the perfect caregiver, and scheduling their timetable of seniorcare in Fort Worth for the month ahead. What role do family members play in their loved one's elderly care in Fort Worth once a caregiver has been hired? Families hire elderly care in Fort Worth for a variety of different reasons. Some like to take a step back from their caring duties to regain a better work/life balance, while others choose in-home care as the result of their loved one suffering from some form of accident or illness. Whatever the case may be, we want you to play as large a role as possible in your loved one's life. That can be in a caring capacity or as a friend, it doesn't matter, as long as your loved one gets to see you on a regular basis. For our part, we'll always include you in any communication and keep you abreast of any changes in your loved one's behavior. Remember, we're a team, and together, we'll give your loved one the best quality of life possible. How do I know if Always Best Care is the right choice for in-home care in Fort Worth? Come in and see us! Yes, you could read our countless good reviews online, but we always think it's better to meet the people behind the business so that you can get a full opinion as to whether we'd be the right fit for you. 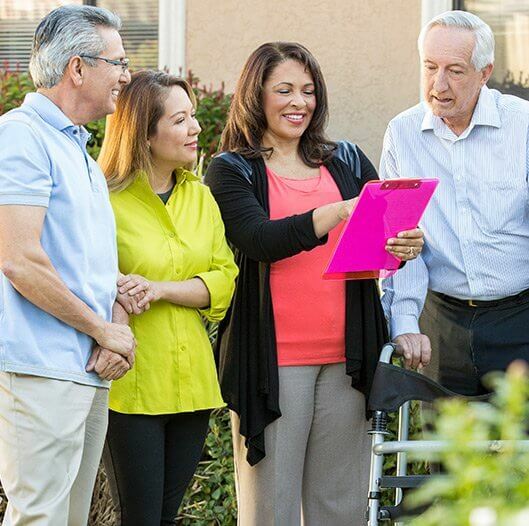 Our consultation is completely free and we're more than happy to run through every aspect of our in-home care in Fort Worth in detail so that you can feel confident moving forward. What steps are taken to ensure that my loved one's in-home care in Fort Worth is safe? The cornerstone of our business is based around making sure that seniors in home care in Fort Worth are safe. To ensure this, all of our caregivers are provided with the most up-to-date safety procedures and are required to carry out regular risk assessments of a senior's home. If they spot any potential hazards, such as a rug, or think of any way to improve a home's safety, such as the installation of rails in a hallway, they will suggest this to you in a written report. Outside of the home, they'll also suggest any items that they think could make your loved one's mobility safer, such as walking frames, canes, wheelchairs, and mobility scooters. Do I need to sign a contract or agree to an hourly minimum for my loved one to be applicable for your home care in Fort Worth? No. We want to be able to help as many seniors that require home care in Fort Worth as possible, and we believe the introduction of a minimum tier service or contracts could harm our chances of doing just that. So, even if you just require a caregiver to help get your loved one washed and dressed on a Monday morning, we'd love to help. Do you provide in-home care in Fort Worth for individuals suffering from Alzheimer's or other forms of dementia? Yes. Dementia affects thousands of seniors and their families right here in Fort Worth alone, so we have an especially devised team of caregivers in place that has been trained on how to cope with certain behavioral aspects of the condition. Along with providing comfort for those living with dementia, our caregivers will also be responsible for ensuring that you have the necessary emotional support throughout your time with us. Those that live with dementia often react poorly to any changes to their usual routine, so choosing elderly care in Fort Worth instead of a nursing or residential home could be the best option for your loved one. If I choose your in-home care in Fort Worth, what type of services can my loved one expect on a day-to-day basis? Do you provide respite in-home care in Fort Worth? Yes. If you're a family that has chosen to look after your loved one on your own, there may be an occasion where you wish to go on holiday or need to take a break due to other responsibilities. In these circumstances, Always Best Care can provide a respite in-home care service in Fort Worth, where one or more of our fully qualified caregivers will look after your loved one during your time away. By taking advantage of this service, you can enjoy your break safe in the knowledge that your loved one will be well looked after by experienced professionals. Rarely do I give a 5-star rating to any company, but this is clearly a deserved rating. I would highly recommend Always Best Care of Ft. Worth. Their care and attention to detail is excellent. After 2 1/2 years of service to our family, they became an extension to our family. Many times they went above and beyond expectations. They communicated very well with family members. Very kind people to the elderly. Vicki is a caring person. This is a wonderful organization. Highly recommend. Very terrific company and great customer service. They found a place for my parents very quickly! I highly recommend. Great company and friendly, caring staff!! Highly recommended! Excellent service and friendly staff!!! I am writing to express my gratitude for the commitment and service of your employee, Shameka Kelly. Through your agency, Ms. Kelly was connected to our family to serve as a caregiver for my sister Victoria who was in the late states of ALS/Lou Gehrig’s disease and required 24-hr. care at home. Shameka served as full-time caregiver under the direction of Victoria’s husband Ron, who was able to keep my sister at home until her passing this past March. This catastrophic and incurable disease rendered my sister completely paralyzed—wheelchair bound, unable to speak, bathe, eat or even lift a finger to do anything for herself. Shameka did what most caregivers would not or simply could not do because of the stamina and patience required to care for Victoria. Before Shameka, we hired a multitude of caregivers who came and went—sometimes only after one day—because of how strenuous and taxing being a caregiver to my sister was. Day after day, Shameka arrived for the job with a smile on her face and the patience and commitment to go with it. My sister Victoria grew to love Shameka, as we all have. It was a great comfort to us because we knew that if Shameka was on duty, my sister was in good hands. Shameka’s character, integrity, humor, honesty and professionalism are beyond reproach. She is an extremely caring individual who is always upbeat, optimistic, and patient. She was an answer to prayer for our family and became more than a caregiver—she became part of our family. She has my highest recommendation for any task or client that may be placed before her. And we will be forever grateful. Nice vibes welcoming workers best people to work with.they work with ur schedules and set up work time that are convenient to work with.